Scirens recently celebrated its second anniversary, so the timing couldn’t have been more fortuitous for me to interview Dr. Kevin Grazier about his book, Hollyweird Science, for a Talk at Google hosted by the lovely and brilliant Ann Farmer. 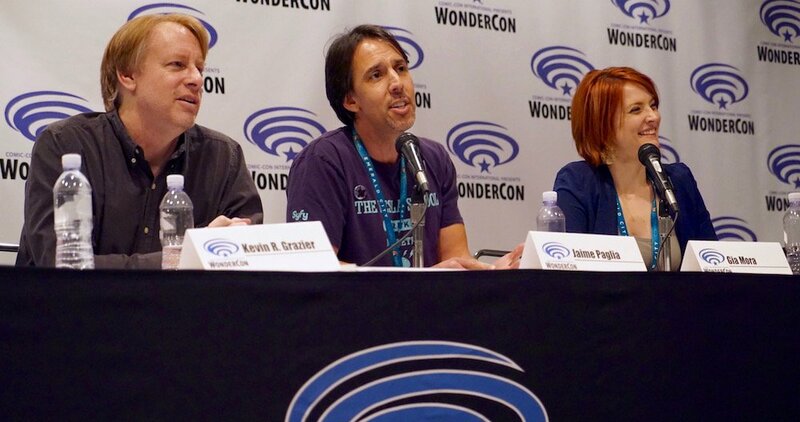 This was the second time I’d had the chance to discuss science in Hollywood with Kevin this year, the first being the Hollyweird Science panel at WonderCon in March. Last week, we sat down at Google HQ in Venice–a campus so fantastical I was nearly ready to abandon my acting career for a desk at the Chrome division–to discuss the second edition of his book and the role of science in entertainment. After a delicious lunch in the commissary (there’s a ramen bar, people!! ), we were treated to a tour and a chance to play around in Google’s incredible virtual reality lab. My first entree into VR was Google’s creation Tilt Brush, a program which combines painting and sculpture in a 3D world of sparkles and endless space. A few months ago at Tyler Ramsey‘s art opening, I’d seen another artist work in Tilt Brush while Tyler spoke. Together, the experience felt like a kind of visualized jazz–ephemeral and free. The art appeared and disappeared from the giant screen behind Tyler. I’d never seen anything like it. When I strapped on the headset for my turn at Tilt Brush, I thought I might never take it off. After orienting myself to the infinite depth of canvas available to me, I was rendered idealess. I kept signing my name, perhaps as a way to convince myself I still existed in this nonexistent world. Embarrassingly, my hosts and Kevin were watching my every move–like at the art opening–on a monitor behind me while my delightful tour guide Brian kept a gentle grasp on the headset cords, just to make sure I didn’t wind up with my skirt over my face. Artist friends of mine believe this technology is the future of rendering for costumers, fashion designers, architects, sculptors–you name it. I believe it. For $500, you too can disappear into the matrix and draw forever. For those using it as a tool, you can screencap parts of your paintings as GIFs which are immediately emailable. (What did I choose to immortalize? My signature. Blech.) The immediacy and flexibility of this technology is downright incredible. We moved on from less creative to more cardiovascular activities. If you’ve ever played Speed Slice on Wii or Fruit Ninja on XBox, there’s a VR version waiting for you. I was not dressed to play–drag races are perhaps the only athletic events at which heels and a dress are appropriate–but I gave those watermelons a run for their money. Between events, the VR world disappears into an endless, colorless room, replete with grid, like a scene from Tron. It reminded me of the whiteout blizzard I got stuck in at Christmas. With no shadows telling you which way is up or down, it’s easy to lose a sense of where you are in space. I’ve heard that if you get buried in an avalanche that you’re supposed to spit to see which way is down. That trick did me no good here. Lastly, I played a first person shooter game where I was taking out alien ships while standing on what looked like the precipice of the Getty in the year 2200. Had we begun with this game, I don’t know that I would have been as enthralled with VR, so perhaps this order was intentional. My hosts, now tired from a long day, wanted to retrieve their cars before the valet closed. We ended our visit talking about the next steps for Google’s VR lab–getting rid of the cords. Brian shared that the building we were in would be renovated soon to include a bigger monitor of the VR viewer as well as surround sound. Guaranteed, if I’d have experienced VR without cords and with surround sound, I would have had to be physically dragged off of the campus. Thanks to Kevin for inviting me to talk with him, Ann for hosting us, and Brian for the fabulous tour!